A new campaign led by Nobel Peace Prize winner Jody Williams is calling for a ban on ‘killer robots’ – armed autonomous systems capable of killing without human input; GeorgiaTech roboticist Ronald Arkin suggests a moratorium instead. What’s your view on these systems? 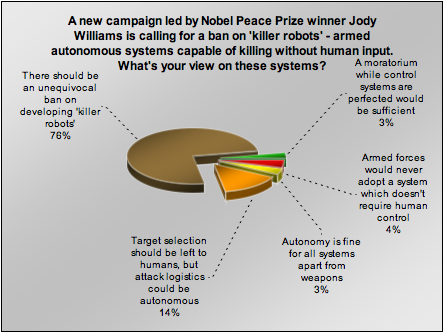 We had an unambiguous result from our poll on autonomous armed systems, with almost three-quarters of the 291 respondents saying there should be an unequivocal ban on developing ‘killer robots’. The next-largest group, 14 per cent, said that attack logisitics could be autonomous as long as target selection remained under human control. None of the other three options, for a moratorium while control systems were developed, autonomy for all systems other than weapons, or for armed forces being unwilling to adopt unmanned armed systems, gathered more than 5 per cent of the vote. What’s your opinion on these results, and this subject in general? Let us know below. It’d daft. Any robot with a prosthetic arm is potentially a killer robot. Look at the latest version of BIGDOG on youtube, throwing concrete blocks around. If you are going to uncage a robot, it’s a safety-critical system, with all that that entails. The fix is in the engineering, not in token regulations, and in the required support network for the robot. Thank you for conducting this poll. I am greatly heartened by the results. The term “killer robots” is not to everyone’s taste but it captures public attention to the topic. It is a bit of a mouthful to say “The campaign weapons that once launched can select and attack targets without further intervention by a human” It is all about maintaining full human supervisory control. The other item that needs to be clarified is that the campaign is not seeking for a ban on autonomous robots or autonomous robotics research. The only concern is the kill function: selecting and attacking targets. Thank you again engineers for making your views known..
Nice sentiments Jody Williams and Noel Sharkey, but you are assuming a Global morality. Sorry folks but it ain’t a gonna happen. The Genie is out of the box. There will be nation states that will use fully autonomous target selecting robots and/or drones. As I said on the ‘other’ blog small comfort can be taken that using highly accurate weapons has dramatically reduced collateral casualties. Think Dresden, London, Hiroshima et al. The only recourse is not to ban these devices but to remove the need to use them!